Caterham Cars is a storied British marque specializing in small open-canopy two-seater vehicles derived from the Lotus Seven Series of the 1950s and '60s. Now, the company says that with renewed interest in the U.S. for British sports cars, they are offering their Caterham Seven 480 and 360 models to the North American market. The powerful little Seven 480 has a two-liter Ford Duratec engine producing 237 bhp and doing a 0-100 km/h (0-62 mph) sprint in just 3.4 seconds. It's top speed is 140 miles per hour. Pricing for this car begins at $52,900. The smaller Seven 360 has the same two-liter Duratec, but outputs less power (180 bhp) and has slower speed times to match. 0-62 is 4.9 seconds and top speed is 130 mph. 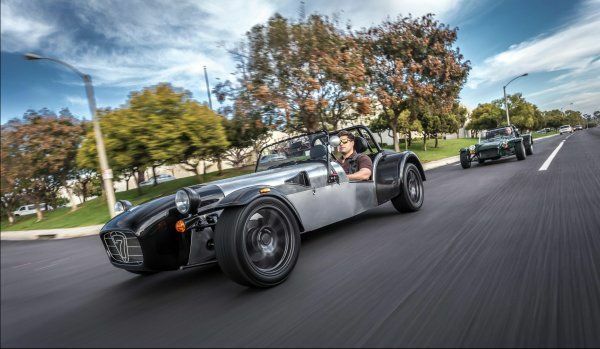 Caterham's U.S. distributor is Superperformance, which now offers the Sevens in rolling chassis kit form. This means that the car arrives partially-built and the buyer must then complete the build, using parts supplied, thus avoiding licensing requirements for an import car. Car aficionados will know Caterham Cars for keeping the Lotus Seven Series alive. Back in 1973, when Lotus dropped the series to move on to other things, one of their largest distributors of the car, Caterham Cars, bought the rights to continue manufacture of the Seven. In 1974, the Series 3 model was re-introduced with the Caterham name. The new Seven, also called the Lotus/Caterham 7, has been the company's mainstay ever since. Continued development has improved the car as technology moved forward, but the basic design and ideal behind the Seven Series is preserved. The aluminum and steel tube body and frame is still there, as is the two-seat configuration and Lotus Seven design form. Interest in the Seven resurfaced with the recent Caterham addition of a F1 Race team.